It's that time of year where we have a different sailfish tournament every week here in Islamorada. If you like competition and light tackle sportfishing you might want to consider entering one sometime! Last week the Sailfly tournament took place, which is a fly fishing tournament for sailfish. It was a 2 day event, and no fish were caught the first day. The second day though, Capt. Alex Adler on the Kalex put his client on a sailfish, and it was enough to win the tournament! Great Job! 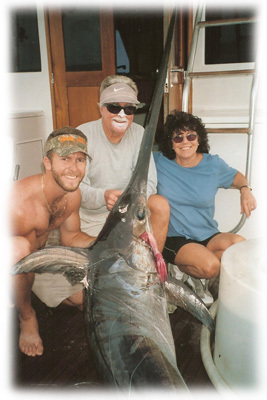 The Islamorada Ladies Sailfish Tournament took place last weekend, and Capt. Aaron Brower on the "Buzz On" led his team of female anglers to a first place finish! They had 4 releases the first day, and 1 more on the second day. It's the second year in a row they've won the tournament. Congrats. This last Friday and Saturday the Cheeca Lodge Presidential Sailfish Tournament took place and the Relentless finished in first place! They released 11 sails the first day on 12 lb test! The second day slowed way down for them, but they added 1 more release, totaling 12 sailfish in all. The Catch 22 finished in 2nd place, with 7 sailfish the first day, and 1 release the second day, for a combined total of 8 releases. Great Job Guys!